Laminate wood flooring can be a great accessory for many homes and businesses. While laminate wood flooring can enhance the appearance of many rooms, it can be challenging to refinish it. Since some laminate refinishing techniques can damage the floor, it's important to be careful when dealing with a laminate wood floor, and to only hire trained professionals. We at Laminate & Hardwood Floors Refinishing are experts at refinishing your Laminate & Hardwood Flooring and restoring it to a like-new condition and shine. Depending on your style of laminate flooring, we will inspect it, recommend service, and carefully refinish the flooring to your desired result. Our trained crews can resurface and refinish any type of laminate flooring. The best way to refinish the floor is to strip off the remaining factory shine and re-coat it with a floor sealer and high-gloss floor finish. Let us give you a free, no-obligation quote today! 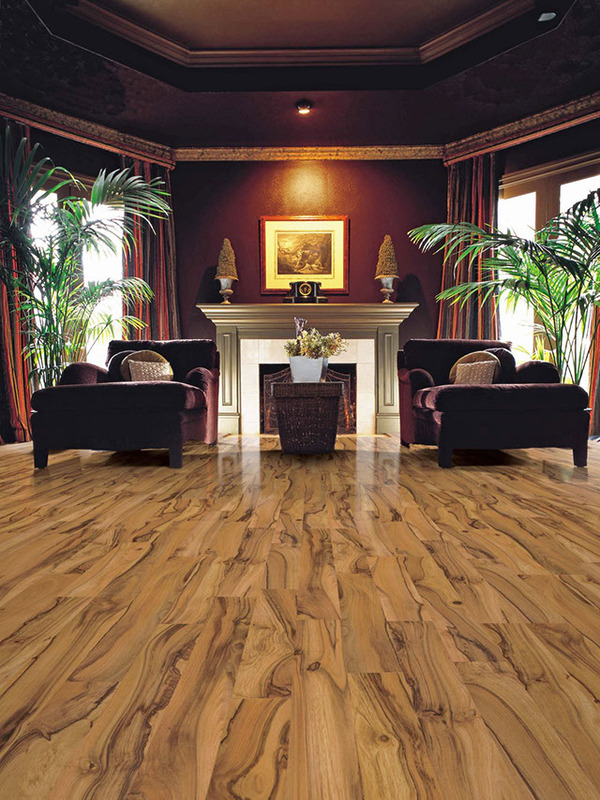 Laminate flooring, formerly referred to as Laminate Wood Flooring, \is not actually real wood. It is a high quality photograph of a wood or tile image bonded to melamine center core. 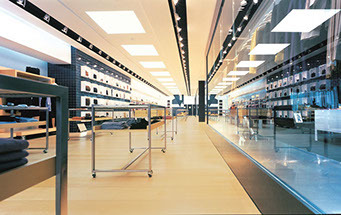 Several layers of a highly protective finish are then applied over it making it a very durable type of floor covering designed to be installed in high traffic areas of businesses or homes. Laminate Floors are very easy and fast to install, and are a great option for many reasons. They are easy to maintain, and inexpensive as an alternative to hardwood flooring. The most common designs have a wood grain appearance while some are made to look like stone or marble. Laminates are designed to look good for many years with a minimum amount of maintenance. Laminate Flooring can be used in both homes in kitchens, living areas, and bedrooms, as well as in businesses including gymnasiums, offices, medical facilities, dance studios, and more. Refinishing a laminate "wood" floor is completely different than refinishing a traditional hardwood floor. Hardwood floors can be sanded, stained and coated with polyurethane. 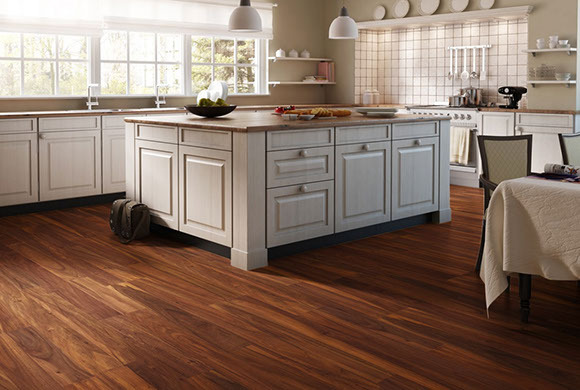 A Laminate & Hardwood Floors should be treated like a no-wax kitchen floor: Never sand it or the look of the floor will be ruined. Laminate & Hardwood Floors are particleboard planks topped with a wood veneer, then topped with clear gloss. When Laminate & Hardwood Floors get dull and worn, you shouldn't fully sand them as you might a hardwood floor, because you're likely to take off the wood veneer layer. A more prudent approach is to screen-sand the floor, using a screening disk that's designed to remove the top layers of gloss but not affect the wood veneer, the re-gloss. Normally, screening involves rough, medium and fine screens, but for laminate, skip the rough screen. 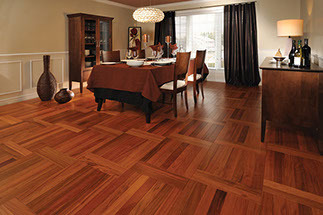 Laminate & Hardwood Flooring simulates the look of hardwood flooring, at only a fraction of hardwood cost. 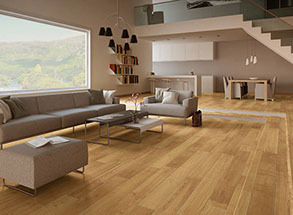 Laminate is made by compressing several layers of wood, topped off with a wood grain that provides the hardwood effect. Laminate & Hardwood Flooring is finished with a gloss protective layer that should be maintained properly to keep the floors looking their best. Using the wrong cleaning products, combined with normal wear and tear, can sometimes leave the laminate floors with a film coating that dulls the appearance of the flooring. The process we use to refinish and revive your Laminate & Hardwood Flooring is second to none. The moment we enter your home, our workers always maintain the utmost professionalism. From start to finish, it is our goal to take the utmost care when refinishing your flooring. We can remove the build up of old dirt, grime and staining. 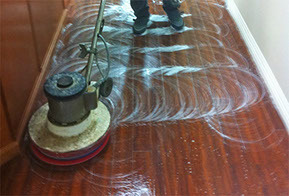 Then, we will reseal the Laminate & Hardwood Flooring with new coatings of lamination to give it a high-quality shine. We guarantee the finest workmanship, and promise to do our absolute best to take the flooring you have and improve it as much as we can. While we are not installing a new floor, we want it to look as new as possible. You can always count on us to provide top notch service and we pride ourselves on total customer satisfaction.